Most people know the Skagit Valley for the annual Skagit Valley Tulip Festival in April. 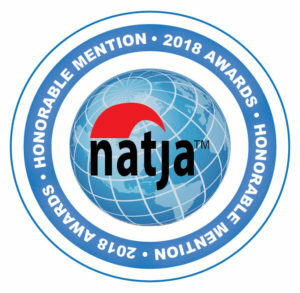 But, it is a destination with year-round recreational opportunities, fields of migrating birds, and fabulous foodie stops including the Farm to Pint ale trail. During the holidays, if your family likes Christmas tree lighting ceremonies, holiday parades and visits from Santa, then a small town road trip to the Skagit Valley needs to be on your holiday list. Here are three ways to celebrate the holidays in the Skagit Valley. Disclosure: You can help support my small town travels by using the affiliate links in this post. This is at no additional cost to you. The tree lighting in the small town of Anacortes takes place in front of the Anacortes Chamber of Commerce building on 9th and Commerical Ave. It officially begins at 6 pm, but the crowd usually starts trickling in around 5:30 pm. One of my favorite things about the evening is Richard Riddell, the Town Crier, who by the way, won first place in the 2013 World Invitational Town Crier Competition. He warms up the crowd with his timeless humor and the spoken crafty words. Then city officials give their season’s greetings, and local school groups sing holiday songs. Afterward, Santa arrives (usually by firetruck) to light the tree. But, it’s not really a tree, it’s a prawn pot tree. A very fitting symbol for this historic fishing town. If you need something to warm you up, hot cocoa and cider are available by donation. For more information on the holidays in the Skagit Valley visit Experience Anacortes. Traveler Tip #1: Arrive a little earlier and pick a spot near the stage as its hard to hear the Town Crier as he doesn’t use a microphone. Traveler Tip #2: Afterward, check out the shops and galleries during First Friday Artwalk. They usually have goodies to snack on, a few offer wine, and there is usually a raffle or two. Traveler Tip #3: If you stay overnight, check out the Christmas Parade on Saturday at 11am which takes place in historic downtown. Dining Tip #4: Anacortes has lots of great restaurants. Some of my favorites are A’Town Bistro, 5th Street Bistro, Shrimp Shack, Vagabond, Dad’s Diner, Adrift, and Secret Cove. Dad’s Diner, Adrift, and the Shrimp Shack are the most kid-friendly. , and hot tea samples. If you want take something home to you, this is the only store that has fish belly, and their shrimp mouse is to die for. You can read more about my travels in Anacortes here. There are plenty of ways to get the local scoop. Find the best deal, compare prices, and read what other travelers have to say about Anacortes, WA at TripAdvisor. 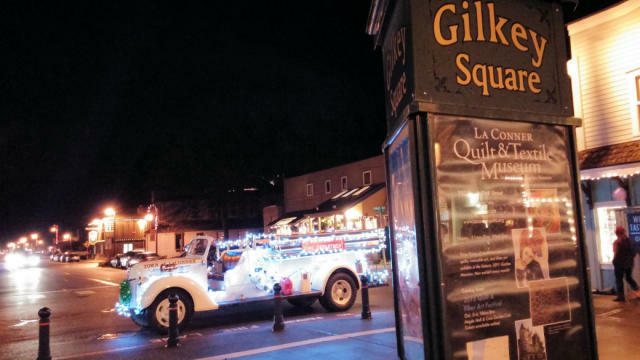 The tree lighting in the small town of La Conner takes place in Gilkey Square, which overlooks the Swinomish Channel. Santa arrives at 5 pm in an old-fashioned fire truck, but there are plenty of festivities before his arrival so arrive early. One of my favorite things about this event is the incredible sugar cookies made by La Conner High School culinary students as well as its smaller size. Before the main event, which, of course, is the arrival of Santa by old-fashioned fire truck, are live music and refreshments. If you are traveling with younger kids, this event is an excellent choice for before lighting the tree, Santa has children gather around the tree, and he sprinkles fairy dust into their palms. Then they collectively countdown to one and sprinkle the tree with the dust, which magically lights it. 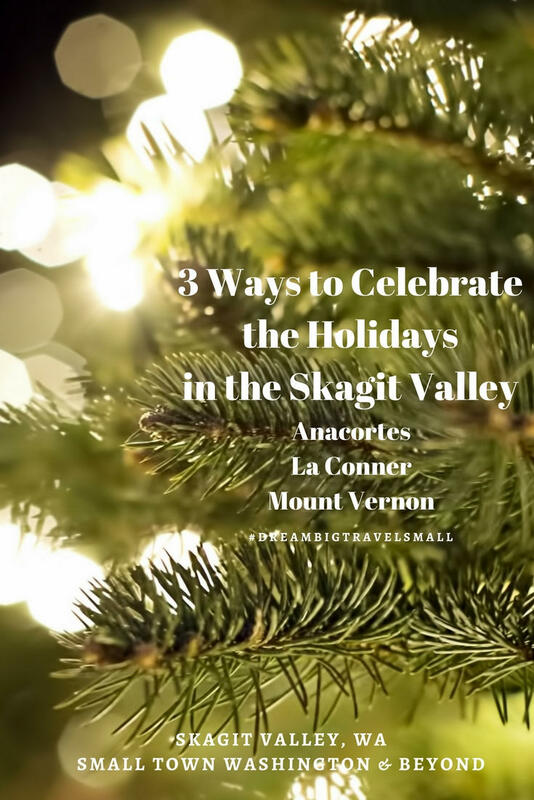 For more information on the holidays in the Skagit Valley visit Love La Conner. Traveler Tip #1: La Conner is a much smaller town than Anacortes, and the streets can get crowded fast, so you might have to park on a side street. Traveler Tip #2: Last year I arrived early and enjoyed a wine tasting at Silver Belle Winery, which is in Gilkey Square. On nice nights, enjoy your wine on their outside patio area with a view of the square. Traveler Tip #3: If you are looking for a place to stay I recommend La Conner Channel Lodge, Hotel Planter and if you have children with you or pets, the La Conner Country Inn. Dining Tip: La Conner has a great selection of restaurants like Nell Thorn, La Conner Brewing Company, The Oyster & Thistle, Aneila’s Kitchen & Stage, Seeds, and La Conner Seafood & Prime Rib. You can read more about my travels in La Conner here. The parade in the small town of Mount Vernon starts at 5 pm. Compared to the other two events, this is the most crowded, and I’d advise to arrive early and stake out a spot. This parade is well-worth seeing as it is full of lighted floats, marching bands, cheerleaders, horses and motorbikes, and of course Santa. It is a sure kid pleaser. The tree lighting ceremony and visits with Santa happen in Pine Square after the parade. Honestly, unless you like fighting the crowd, I would not bother with this part of the event as everyone ascends on Pine Square and it gets congested. I found the other tree lighting ceremonies much more pleasant experience, so the focus for this event would be to experience the parade. For more information on the holidays in the Skagit Valley visit Downtown Mount Vernon. Traveler Tip #1: Arrive early and stake out a spot! Traveler Tip #2: Skip the tree lighting ceremony as Pine Square gets crowded. Instead, walk along the riverwalk or head to a nearby restaurant. Dining Tip: There are lots of great eateries downtown Mount Vernon like Trumpeter Public House, Skagit River Brewery and Restaurant, Calico Cupboard, Skagit Valley Food Co-op Deli, and one of my favorites is Pacinoi’s Italian Restaurant. If you are kid-free and a beer lover head to Farmstrong Brewing Company and North Sound Brewing. Allison, You have to go to a tree lighting! They are a great way to celebrate the season. Wow, that’s a perfect schedule for December. 1-3! Three small towns kicking off Christmas. Would love to do that!!! I would love celebrating the holidays in any of these 3 destinations. I love a good old-fashioned celebration like these. 😉 Fire trucks, Santa Claus, tree lightings, sign me up! Melody, If you come this way we check them all out! Melody, If you come this way we will check them all out!